Building a marketing and communications agency, much less any business from the ground up, isn’t easy. Finding new business, hiring and retaining great talent, and consistently delivering quality work can be an ongoing struggle. And that can be particularly challenging when you are servicing the government and non-profit sector, given their budget limitations. But Joseph Ney, Creative Director and Partner at Reingold, has done just that. Along with his partners, they have built Reingold into a leading firm that has achieved incredible growth over the past few years. But it took continuous experimentation and evolution to get to where they are today, and they are still tweaking. And that path, of course, wasn’t linear – but they were always mission-focused. Joseph discovered his passion for marketing while he was in business school, as it blended two of his interests: art and business. So he went down the path of advertising and communications, further developing his skills and experience at art school and at major ad agencies in New York. But as an entrepreneur at heart, Joseph and his friend from business school knew they wanted to build their own agency business. Given their backgrounds in non-profits, coupled with work experiences, they could see what worked, what not to do, and the opportunity to do it better on a smaller scale. So they set out to leverage their experience and figure out how they could expand non-profit and government agencies' missions, amplify their voice, and ratchet up their visibility on a non-profit or government agency budget, as opposed to a Fortune 500 budget. But exactly how that would manifest itself was definitely something that they had to figure out along the way. 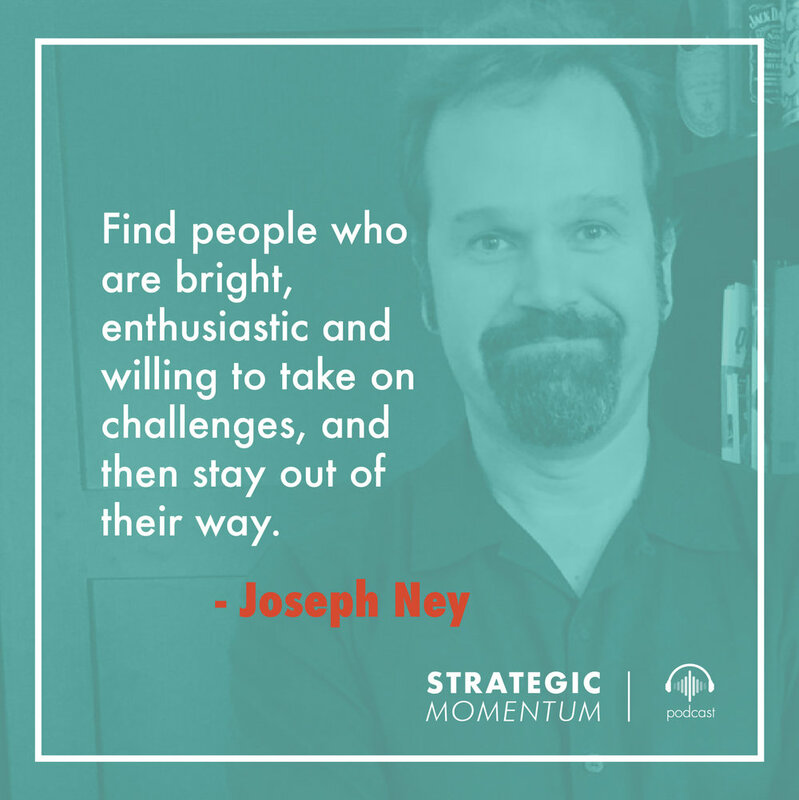 Staying nimble, flexible, and efficient helped Joseph and his colleagues learn how to continually optimize their delivery with every step of the process. From assignment to assignment, it eventually led them to an acquisition opportunity that positioned the organization for greater growth. But expanding the company wasn’t without its challenges, particularly on the people front. Given their initial size and the types of clients they had, they knew they couldn’t afford high-priced talent. So they focused on other factors that they knew could be of value. This principle, coupled with offering employees the opportunity to work with cause-related efforts and giving them significant responsibility early, resulted in hiring and retaining great Millennial talent that has been instrumental to their growth over time. What may have been effective in the past may not be effective going forward, and being aware of that as you scale is paramount. You can’t continue to grow and do everything the same way you used to. And after reaching 150 employees, Joseph and the other partners recognized that they had to think and operate differently. Maintaining the ability to stay agile and flexible is important, but you can’t let the mission of your organization get obscured as you pivot. And for Reingold, it didn’t necessarily matter that they had the perfect culture, paid top dollar for talent, or offered high profile positions/titles. What mattered is that everyone bought into the same philosophy and has an inherent understanding of it. This focus on delivering great results through dedication to a client’s mission, as well as your own, can certainly lead to success. A culture of experimentation helps you evolve, grow, and create the flexibility that is necessary to adapt. Your observations and learnings over the course of your business should indicate that how you manage things isn’t going to be right at every scale. Be mindful of what works for you and what doesn’t; understand that it may constantly evolve depending on the opportunity that is presented to you. Fostering an opportunity mindset predisposes you to take advantage of potential opportunities and helps you pivot and adjust. Find people who are bright and enthusiastic and willing to take on challenges – and then stay out of their way! Having a clear mission for your organization matters. It gets everyone rallied around the common beliefs and understanding of how the organization operates. Not everyone is going to gel with the way you do things, and it’s better for both parties if you recognize that quickly. In the end, making those personnel adjustments as soon as you can results in fewer mismatches in the long run.